The question, then is not who the werewolves of the sixteenth century were, or the vampires of the eighteenth…. The more relevant question is why: Why should it have been widely believed, and widely feared, that men were stalking the land as wolves? What is so terrifying about the vampire, a creature that, despite its hman form, bites at the flesh of its victims? Why do dark forces so often manifest themselves in the shape of a dog? …The animal infection – the zoonotic idea – is mankind’s original horror, and its etiology traces back inevitably to the rabies virus. My grandparents visited us a few weeks after the girls were born so they could see them in person. As we were all sitting around my living room one evening, my grandmother asked what I was reading at the time. “A cultural history of rabies,” I responded. She thought it sounded interesting, but my father looked at me as if I was a lunatic. 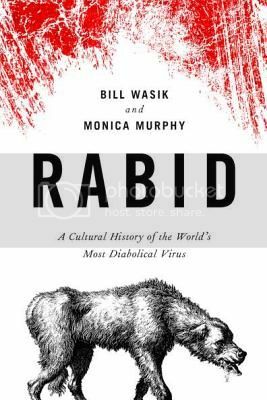 Perhaps a book about rabies would not be the first thing that most people think of when they are looking for a good read, but it would be a mistake to discount Rabid by Bill Wasik and Monica Murphy. Rabid is a complex and complete look at rabies and its place in human history. Waskik and Murphy cover everything from the ancient views on rabies and potential rabies treatments, to the place of rabies in literature and the monsters created in the human psyche, to the ways the rabies virus is being used today to solve other major medical issues. Rabid is a well-rounded book including both the science and culture of the rabies virus that is also an absolutely fascinating read. A strong science background is not a necessity, Wasik and Murphy write the science sections clearly and concisely and maintain an engaging prose style throughout. There was a news article the other day about a woman swimmer in Va. being attacked by a rabid beaver. It was scary! Despite being whacked continuously the thing wouldnt stop biting her. Rabies seems one of the most dangerous viruses. Perhaps the book goes into some weird awful reactions of the virus. It is very dangerous if you don’t get the treatment in time, almost 100% fatality rate. It does talk about the hydrophobia, etc, and a bit about the biting reflex it causes in dogs. This sounds kinda fantastic! And I haven’t read a book like this in a while, so it’s going on ze wishlist. It is SO fantastic! Yay! I mean, I was INTERESTED in it, but I didn’t anticipate not being able to put it down. I’ve always been a little afraid of dogs, and the idea of a rabid dog was even scarier. The book does sound interesting! Sounds like a great read to me! I love nonfiction of that sort. It’s on my ‘to find’ list now.